The young Bristol based singer Elles Bailey, with her trademark smoky vocals, husky tone and lived in voice, has been gaining recognition wherever she performs. With her influences coming from many genres, from rootsy blues and soul to blues rock, Elles always stays true to her voice. Her popularity comes from her breaking down of traditional genres, taking aspects from them and fusing them together in order to create the sound which has become known as her own. 2017 has become a very busy year for the songstress and her band. With numerous dates scheduled in as well as festival dates, all in the lead up to the release of her debut album. 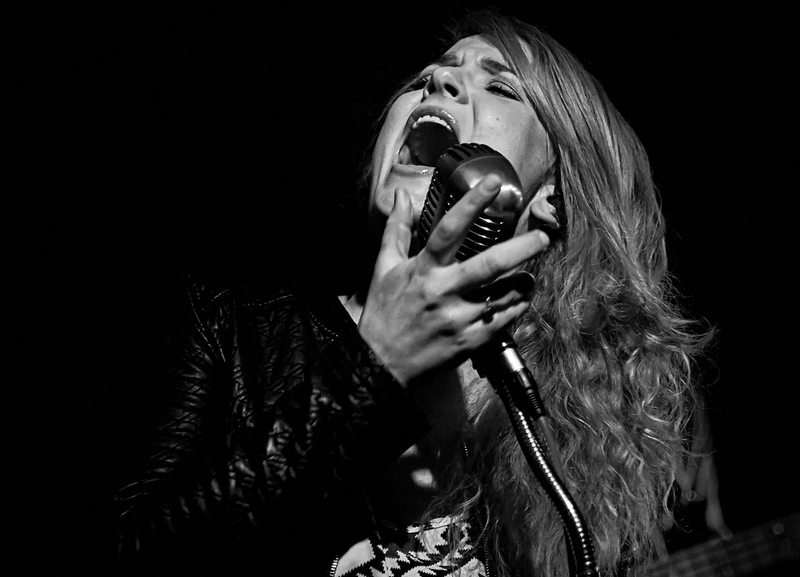 Elles has opened shows for acts such as Wille & The Bandits, Mud Morganfield and Jo Harman. In doing so this hard working singer has built up a loyal fan base through her continual touring. The new album ‘Wildfire’, which will be released this September, features some world-renowned country and blues musicians including Brent Mason on guitar and pianist Bobby Wood. Elle’s story is one in which the hand of fate seems apparent. At the age of three, she contracted both bacterial and viral pneumonia and, through operations to save her, the doctors gave her the rough, smoky voice she has become renowned for. By age four she was performing, and by eight she knew that she wanted to be a star. Refining her own talent, she stumbled onto the opportunity to record Wildfire almost by accident – on a family road trip, they took a detour to Nashville in order to create one track. Before long she was working on an entire album with the cream of Nashville’s crop, and this would eventually blossom into her first album. Even without her first album released, she has a strong following and a rising popularity. This comes from the pair of EPs she has released: ‘Who I Am To Me’ and ‘The Elberton Sessions’, both of which had very different post-production styles. We caught up with Elles before her show at Arlington to see how she has been in the lead up to her tour. 1) 2017 has shaped up to be a busy time for you, how are you finding all the tour dates combined with the release of your album? 2) How was it for you experimenting and finding this meld of musical genres to create the sound that fans distinguish as yours? It’s been a musical journey and over the last few years I have developed my sound. I think for me it’s been all about the songwriting and writing songs that are honest and that’s been a big part of honing my sound. Last year I really focused on being the best songwriter I could be and that’s paid off I think… however with the relentless touring and promoting of this album , songwriting has fallen by the wayside a bit. But I have been told that’s ok! 3) What has been one of you favourite gigs that you have played? Is there one that will stay in your mind for a long time? 4) You have been lucky enough to support many different singers over the years in opening their shows. How different was is when you started doing shows of your own? I feel really lucky to have opened up for the artists I have done, touring with Jo Harman on her last tour was a dream but it’s always great to do your own headline tour- especially when you see people you met when you have opened for other artists and now they have come to see you! That’s a great feeling. 5) You already have an extremely loyal fan base, who are all excited to see you branch out to bigger venues. What would you say to all your fans who have been behind you the whole way? THANK YOU SO MUCH !! I have a wonderfully loyal and vocal fan base and I feel truly blessed that they have come on this crazy journey with me. Having run my pre order campaign for my new album wildfire I have been blown away at my fans generosity and support. It’s so humbling and I can’t thank them enough- I look forward to the next stage of the adventure with them. 6) With the new album out and a full tour schedule, will you be looking forward to a break once you finish or is it on to the new project? So I’m currently writing this as I’m sitting in Spain having a couple of days r&r before the album comes out and the tour schedule hits. I have a feeling this is going to be my only break for a while and next year is getting pretty booked up and a lot of people are already asking “what’s next” ! I better start writing that pesky 2nd album I guess. Elles is performing at Arlington Arts on Friday 6th October at 8pm. Tickets are available at £11 each. You can purchase your tickets online at www.arlingtonarts.co.uk through our What’s On section or you can call our Box Office on 01635 244246. For access or carer tickets please call our Box Office.